Advertiser.ie - How could ‘hysterical’ women be allowed to vote? 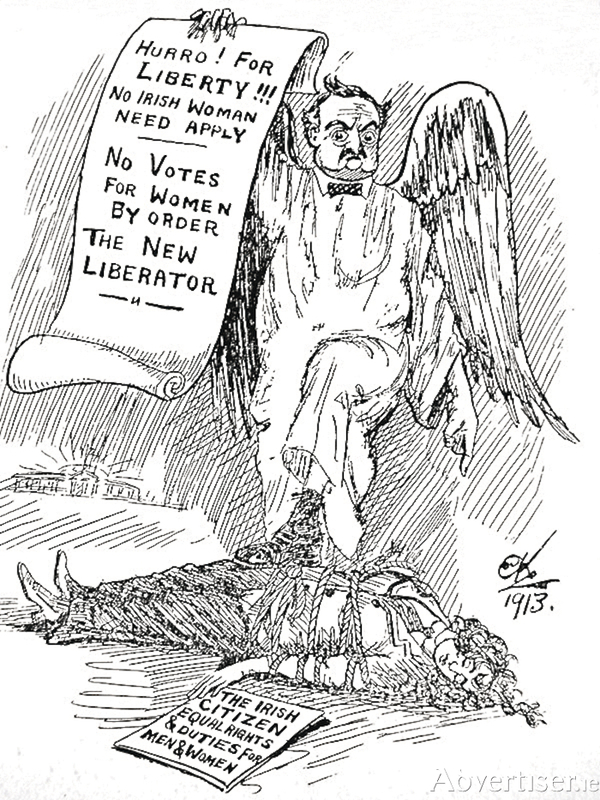 The opposition of John Redmond and the Irish Parliamentary Party to the suffragette cause is lampooned in this Ernest Kavanagh cartoon, published in The Irish Citizen, March 1913. By 1912 the commitment by the British prime minister, Herbert Asquith, to support, and to pass this momentous bill, on its third attempt, would practically ensure its success. He was supported, and kept in power, by the Irish Parliamentary Party led by John Redmond. It would seem that there was no other issue on the minds of Irishmen than Home Rule. In fact there was one other issue that was elbowing its way on to the national stage: the right for women to vote. Both Asquith and Redmond had absolutely no time for women’s suffrage, and no mention was made of granting women the right to vote in the proposed Home Rule Bill. It seems ridiculous today that as recently as 100 years ago, women were denied the right to vote. The ideal Victorian woman was expected to fit into certain roles. A girl of good standing was expected to to be proficient in painting, music, sewing, and to make an amiable attempt to speak French. When she was older she would be a housewife who took care of her husband’s home and children. She would tend to his needs and desires in every way she could. On top of all that, it was believed that women, unfortunately, were subject to hysteria. How could you let a women have the vote if she was hysterical? By 1912, however, it would be wrong to think, that while a growing number of English women were bravely dodging the ‘cat and mouse’ act, and hurling objects at politicians, all Irish women were at home, making tea and comforting their husbands. In fact the summer of 1912 was to prove hotter than its climate when the Irish Woman’s Franchise League* began its militant campaign in Dublin on June 13. Eight members, including Hanna Sheehy-Skeffington, smashed the windows of the GPO, the Custom House and Dublin Castle. The women were all arrested, and sentenced to six months in jail. There was very little about it in the newspapers, even when the women went on hunger strike. All the news was about Home Rule and the coming visit to Dublin of Prime Minister Asquith.To liven things up a bit four English suffragettes, Gladys Evans, Mary Leigh, Jennie Baines (under the nom de guerre Lizzie Baker ), and Mable Capper stood on O’Connell’s Bridge as the open carriage, bearing best buddies Redmond and Asquith, came along. Mary Leigh suddenly hurled an axe at Asquith which just missed him. But it struck poor Redmond on the arm with some force. Utter confusion and hysteria erupted, allowing the women to escape to the Theatre Royal where Asquith was due to speak. One of them set fire to a chair, hurled it into the orchestra pit, intending the set the theatre on fire. The women were arrested, and smartly marched to the nearest police station. On August 7 all four women appeared at the Green Street Criminal Court where they were sentenced to five years penal servitude. ** After a miserable time of hunger strikes, harsh conditions, and forced feeding the women were eventually released due to ill health. There could be no doubt, however, that the suffragette movement really meant business, and it was becoming a national issue. Women were told, she said, that the granting of the franchise would turn women’s mind from the home and the family and that they would become involved in political turmoil. Mrs Earl pointed out that the franchise movement was supported by members in all parties in the House of Commons, and whenever an election was called candidates were only too happy to get their women folk out on the canvas trail, and to speak on behalf of their man. This was followed by applause. Mrs Earl agreed that some women could become hysterical, but so could men. ‘If the argument prevailed in one case it should also prevail in the other!’ This was followed by more applause! Next week: Who the women in the audience were, and what Christabel Pankhurst had to say to her Galway meeting. NOTES: *The Irish Women’s Franchise League (IWFL ) was the Irish equivalent of Emmeline Pankhurst’s Women’s Social and Political Union. It was founded by husband and wife Hanna and Francis Sheehy-Skeffington, an unusual pair even by today’s standards. Both were vegetarian pacifists, who, unusually, took each other’s names on marriage. Together they founded The Irish Citizen, the first feminist newspaper in Ireland. They were both nationalists but believed that any Home Rule Bill must provide equally for men and women. ** During Mary Leigh’s trial Mr Busche KC, on behalf of the Crown, said that while the prisoner was a woman of wit, and eloquence…’they were in the presence of a woman of a disordered mind’. Leigh objected to that description. *** Christabel was the daughter of suffrage movement leader Emmeline (who had addressed meetings in Dublin ), and radical socialist husband Richard Pankhurst. Her two sisters were Sylvia and Adela. Richard was a barrister, while Emmeline owned a small shop. References include History Ireland (Spring 1996 ), The Galway Express, Mary Clancy’s essay on Campaigning for the Vote in Early 20th century Galway, from Irish Women and the Vote, edited by Louise Ryan and Margaret Ward, republished by Irish Academic Press 2018. I am grateful for the help of Mary Qualter of Galway Co Library.